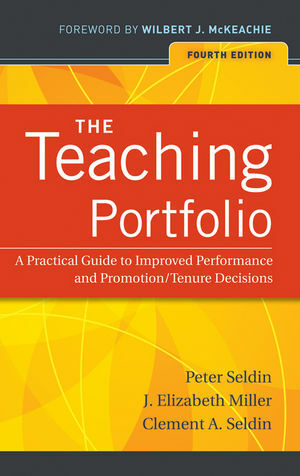 Peter Seldin is Distinguished Professor of Management Emeritus at Pace University in Pleasantville, New York. He has been a consultant on higher education issues to more than 350 colleges and universities throughout the United States and in 45 countries around the world. He was named by the World Bank as a Visiting Scholar to Indonesia, and he was elected a fellow of the College of Preceptors in London, England. For his contributions to the scholarship of teaching, he has received honorary degrees from Keystone College and Columbia College (South Carolina). J. Elizabeth Miller is Associate Professor of Family and Child Studies at Northern Illinois?University. Previously, she was the university director of the teaching assistant and training development office, where she established and ran the training program for more than 800 teaching assistants. She is the recipient of several teaching and service awards, and her research focuses on the interplay between feminist teaching and learner-centered teaching. Clement A. Seldin is Professor of Education at the?University of Massachusetts, Amherst. He has worked with Peter Seldin and Elizabeth Miller countless times as a mentor of faculty preparing their portfolios, a presenter at national conferences, and coauthor of books and journal articles. He has many years of portfolio experience and a?solid national reputation as practitioner.